We hope you enjoy your journey to increased health and vitality through chiropractic care. 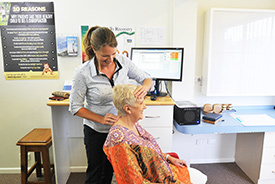 As chiropractors in Mt Warren Park we understand that you want to feel better quickly and we want that too. Natural healing does take time and the rate of progress varies from person to person. If you are concerned with your progress, please tell the chiropractor immediately. Your appointments have been especially scheduled for your individual needs. With each adjustment your spine is being re-aligned to its natural position. That is why it is vitally important that you keep to your schedule as missing appointments will drastically reduce the effectiveness of your treatments. We will be concerned if you miss an appointment, and our receptionist will call you to make sure everything is OK. If missing an appointment is unavoidable the receptionist will ask you to re-book with-in 24 hours of your original appointment. You will see one of our four chiropractors, Dr Mark Pickford, Dr Christine Thatcher, Dr Craig Matthews and Dr Julie Hunter. You can ask to see or change over to another chiropractor at any time. If at any stage during your care, you feel you would like to spend more time to discuss your progress with the chiropractor, please ask the receptionist and she will make a longer time available for you. Preparing for your adjustment is simple! Before each adjustment could you please remove any jewellery, belts, wallets, glasses and any other items that may restrict the chiropractor when giving an adjustment. Containers for your valuables are available at reception. Payment for your care can be made before or after your adjustment, or to save time you are welcome to pre-pay for a number of visits. Payment can be made by Cash, Eftpos, Credit Card or Cheque. Click here to view our office hours, contact details and office location details. 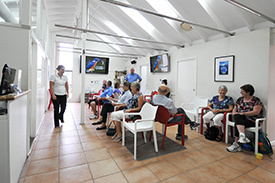 Click here to learn more about what to expect at your First Visit.